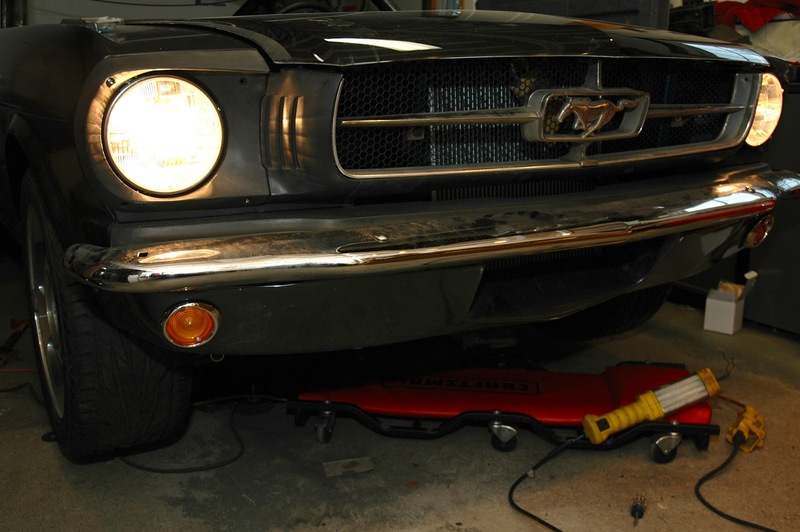 The illustrated story of Restoration, Modernization, and Modification of my 1965 Fastback Mustang. Next job is to install the parking lights, headlight bowls and headlights. After that, wire in the headlight relays. I would recommend mounting the parking lights in the valance before bolting on the valance itself. The mounting nuts are easier to get to if the valance is off the car. Once the parking lights are in, feed the wires up through the hole in the bottom of the headlight recess and plug into the harness. This is a good time to inspect headlight plugs and wiring before moving on. Make sure the wires are not melted or frayed and about to break off. The replacement headlight pigtails are easy to get if needed. Luckily, I didn't need to replace mine. Next, I installed the new headlight adjusters, springs and bowls. Here is an easy way I found to install the bowl and springs. First snap in the adjusters and remove the two adjuster screws from the plastic mounts. Then, with the spring hooked in the back of the slot and holding it in place with one hand, I turned the bowl around so the front is facing back and hooked the spring into its hole in the headlight bowl. Next, carefully turn the bowl around with the spring still hooked and line up the tabs with the adjuster holes. While still holding the bowl in place, start one of the adjuster screws, making sure that the slot in the screw is engaged correctly with the slot in the tab. Start the other adjuster screw and run in both screws until the bowl is pointing basically straight ahead. From here its pretty simple. Plug in the headlamps and mount with the stainless retainer rings. After a quick test I found that my headlight ground wires were not attached. Oops. Once I knew the headlights were working right, I started the upgrade of the wiring. Its a pretty simple concept. Control a high amperage circuit with low amperage circuit. A simple way to do this is with relays and I found a couple 12 volt ones that can easily handle the load. The circuit diagram is pretty simple. You just cut the low beam and high beam wires and use them to energize the relays. Then run 12 volts to the common terminal and the other end of the cut wires to the Normally Open contact. 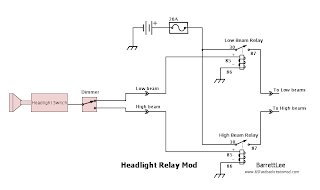 The idea of adding the relays is to reduce the current flowing through the headlight switch and thin wiring and should eliminate burned out switch and melted wires. 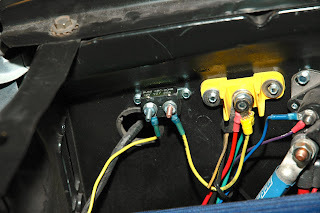 On my Mustang, I placed the relays up front on the apron close to the radiator support. This way, the wires to the headlamps are short. Make sure that the lights already work properly or you will be troubleshooting old problems. Also, remember to disconnect the battery. 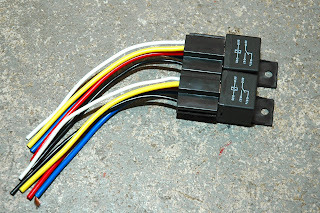 The relays I used came from Summit Racing http://www.summitracing.com/parts/via-80238. They are not very weather proof but they should be fine for my application. Note: Modifying wiring incorrectly (especially without a fuse) can be a fire hazard and should be performed by an experienced technician. Author is not responsible for damages caused by incorrect wiring. Use of these directions is at your own risk. I started by unwrapping the headlight harness at the junction where the wires split off to the right side. Next locate the thin red-black and green-black wires. 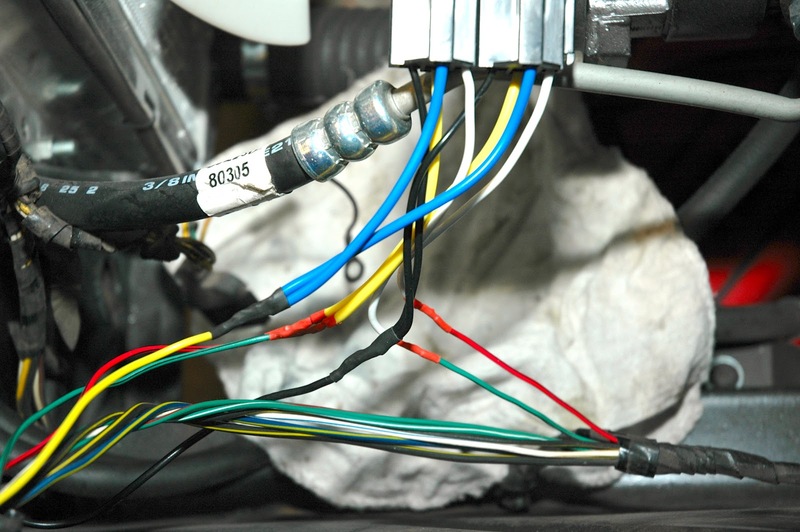 These are the wires that come from the dimmer switch to power the high beams and low beams. I chose a spot about 6" back from the split and cut just the red-black and green-black wires. For my car, I chose to solder the wires for solid connections and use shrink tube to insulate. Next, you need a hot lead to power the headlights. Find a 12v lug to connect the hot lead. On my Mustang, I have a 12V lug in the area where the battery used to sit. You could also use the hot side of the starter relay. I chose to use a 20A circuit breaker instead of a fuse. Do not wire this up without a fuse or breaker! Connect a 14 gauge wire from the hot lug to the breaker/fuse then from the breaker/fuse, routed to the headlight relay area. Connect the battery and test the headlights. 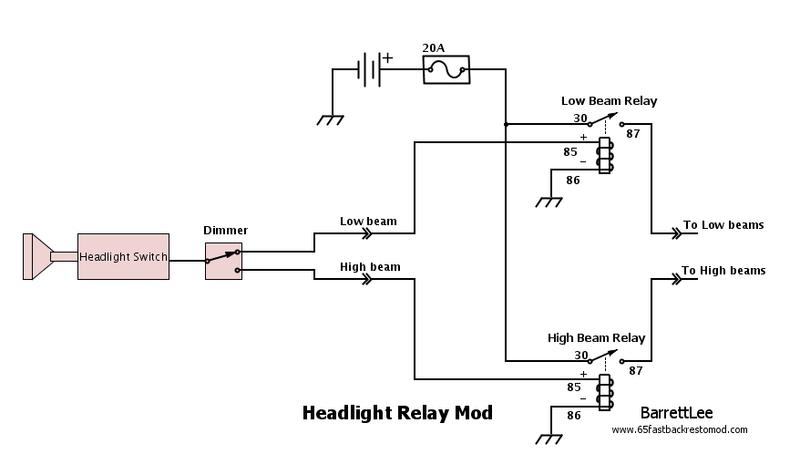 Try hi beam and low beam. Re-wrap the harness and make sure the new hot lead is secured. Mount the relays. Originally the current flowing through the headlight switch and wire for my 55 watt head lamps was 5 amps. Now its only 0.14 amps. Now you can run those high watt headlights and not burn out your 47 year old switch and wires. If your headlights glow really dim, its likely that one headlight ground is disconnected and the power is back-feeding through the other filaments to the good ground. Mustang Enthusiast, Software Engineer, Auto mechanic, photographer.